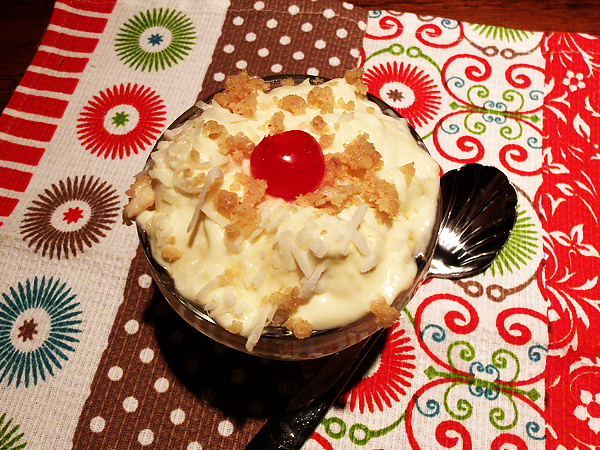 Pecan Sandie Cream Cheese Banana Split Cake - Ready. Set. Yum! Light, but bursting with flavor, this cream cheese based icebox pie is hands down one of the best I’ve ever tasted. No bake, no fuss. Just delicious! Start by making your whipped cream. Now you can skip this step, but I wouldn’t dare. Sure, the whipped cream that you buy in a tub will do the job but it wouldn’t be as good. Whipped cream is easy to make and only takes minutes. Start with a pint of heavy whipping cream, pour it into your mixing bowl. Add 4 teaspoons of sugar and a teaspoon of vanilla extract. Mix on low to medium speed until soft peaks form on your beaters and it’ll kind of hang up inside the tines. If you are using a stand mixer, you might want to stir it with a spoon a few times through this process because your sugar might not get picked up on the bottom of the bowl. Refrigerate the whipped cream, you’ll need it again in a bit! 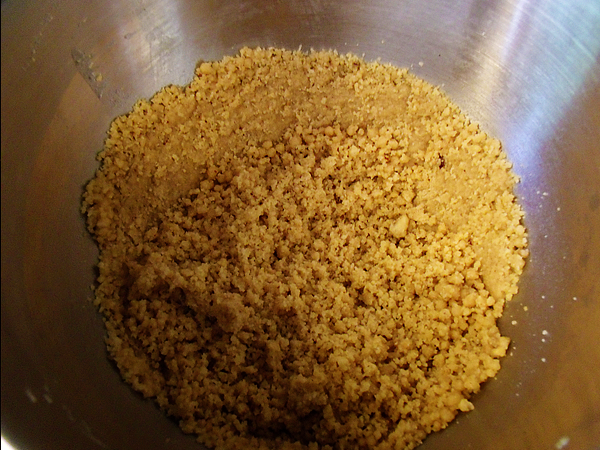 To make the shortbread crust, take your pecan sandies, break them up a little and then toss them in the food processor until they are ground up like coarse meal. If you don’t have a food processor, you can do it the old fashioned way. Put them in a plastic bag, grab your hammer and pound the dickens out of them. You might even be able to vent a frustration or two while you’re pounding away! 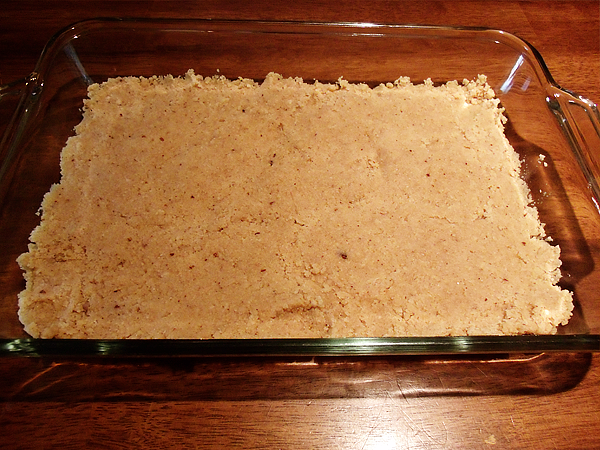 Put it into a waiting 13×9 or 13×11 inch lightly buttered dish and press down and spread until you’ve made a crust. See all those nice pecan chips in there? Lovely! Now mix up your vanilla pudding. You can use either instant or the kind you cook on the stove top. Just follow the directions on the package. When it is finished, set aside. Soften 8 oz of cream cheese in the microwave. Do that by cubing it up a little then put it in a microwave safe bowl and heat it on high for about 25-30 seconds. If you’re on top of things (unlike me) you can just leave it out and let it soften at room temp. I never tend to plan ahead that well. But either way works, as long as it’s soft. Put the softened cream cheese in a mixing bowl, then add a 14 oz can of sweetened condensed milk. Using a medium speed on your mixer, mix until well blended. Then add the vanilla pudding, along with a teaspoon of vanilla extract and about 1/4 teaspoon of salt. Mix again. Drain the juice from an 8-10 oz can of pineapple chunks and add the chunks to the mixture. Slice up two large bananas and throw those in there too. Stir the whole thing up with a big spoon. Don’t try to mash up the fruit pieces, just stir them in. NOW you are ready for the lovely homemade whipped cream waiting in your fridge. Dump it into your mixture and fold the whipped cream into it. In the kitchen folding is basically just a gentle kind of stirring. I usually do it in an under and over motion, but just a gentle stirring accomplishes pretty much the same thing as far as I’ve been able to tell. Hopefully the Gourmet gods won’t throw a thunderbolt down on me, but c’mon. It’s just a lazy kind of stir. Now dump it all into your waiting crust and smooth it out until it is nice and level. Sprinkle the top with shredded coconut. This is kind of optional. If you don’t like coconut. it is no biggie to leave it off. Sometimes I use chopped walnuts or pecans, or all three! Put this into the refrigerator and forget it’s there (if you can!) for 4-5 hours. I usually leave mine in overnight, but if you can’t do that those few hours will do. 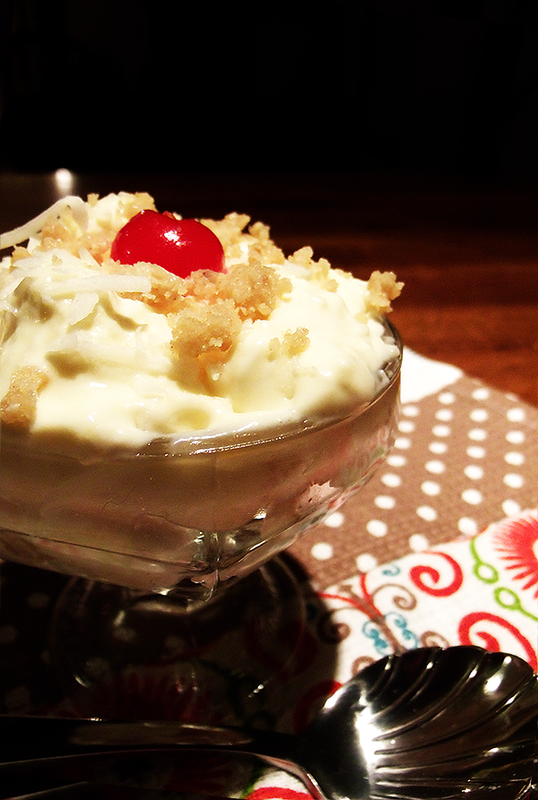 Serve in dessert cups and garnish with maraschino cherries. Chopped walnuts or pecans also make nice toppings. This is so good you won’t believe it! Yummy icebox cake/pie made with cream cheese, sweetened condensed milk and fruit. Best of all, a pecan sandie crust! Melt butter in a microwave safe bowl. Set aside. Crush the cookies into a meal like powder. You can do this with your food processor or if you don't have one, put the cookies in a plastic bag and pulverize them with a hammer! Yes, you can do that. Combine melted butter and cookie crumbs in a mixing bowl. Beat until cookies are coated and look like meal. ** For homemade whipped cream, pour 1 pint of heavy whipping cream into a mixing bowl, add 5 tablespoons of sugar and 1 teaspoon of vanilla. Whip on low to medium speed until still peaks form, then refrigerate while you prepare the rest of the filling. Prepare vanilla pudding according to package directions, set aside. 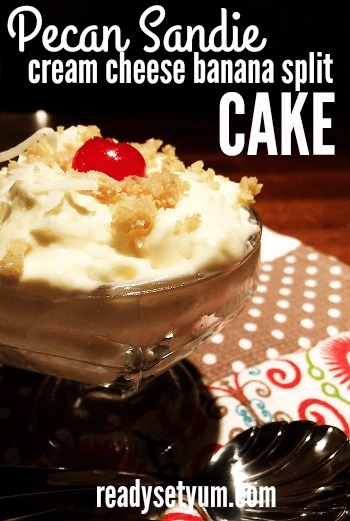 In a large mixing bowl, put in the softened cream cheese, add sweetened condensed milk, vanilla extract, salt. Use medium to high speed and mix well. Then add vanilla pudding. Mix again. 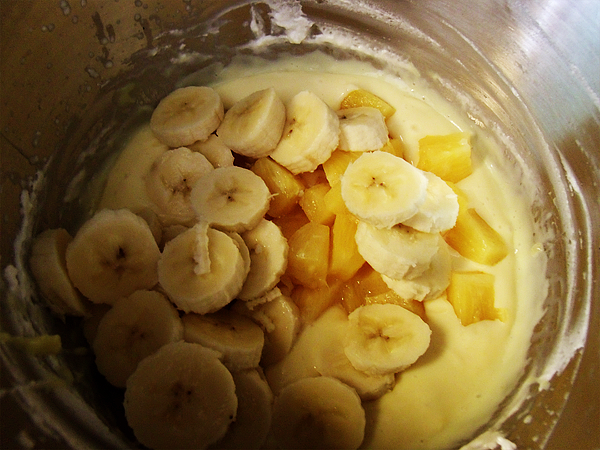 Stir in slice bananas and drained pineapples. Hand mix into the filling. 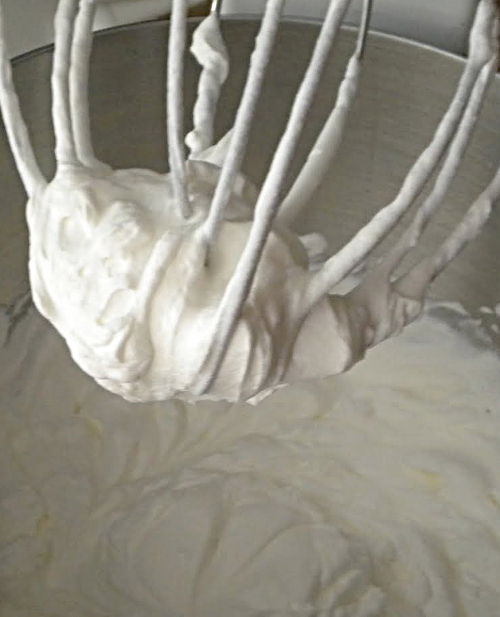 Remove whipped cream from the fridge and using a slow stirring motion, add to the filling. 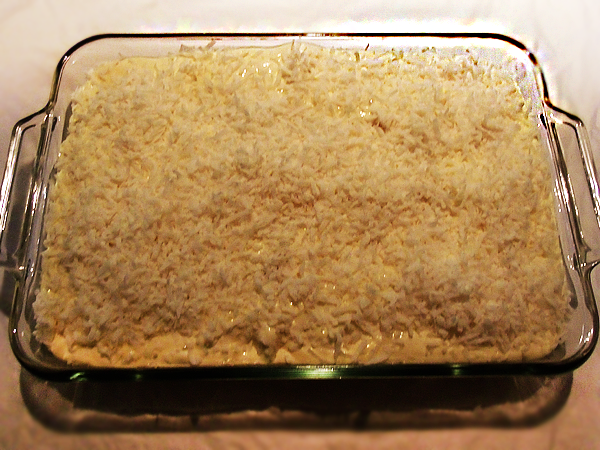 Spread mixture over crust, top with shredded coconut (optional) and refrigerate for 4-5 hours. Spoon in dessert dish for serving. Add garnish of maraschino cherries, nuts, or chocolate. What ever you prefer!